There’s not much “revenge” in REVENGE OF THE CREATURE, except maybe the filmmakers’ revenge on clear-thinking movie viewers. Scientists led by John Agar capture the CREATURE FROM THE BLACK LAGOON and bring him to civilization to “train” him. And kill him. Called the “Gill Man” by the tourists and sightseers that call themselves “scientists,” the creature spends 90 percent of his onscreen time chained in a public aquarium, where he is shocked with a cattle prod by empathetic scientists in an attempt to make him open a pic-a-nic basket, and gawked on by rednecks. Then he escapes, crashes a swank party, grabs a girl – for the perfunctory photo op of “creature holding girl” – and is killed, using the same footage of him sinking under the water as they did in BLACK LAGOON. 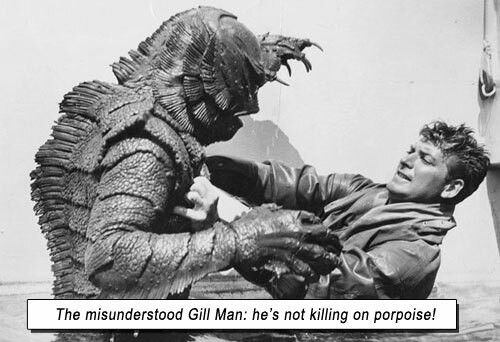 Not once – not once – is there any intimation that maybe – just maybe – the Gill Man is killing people when he escapes because he’s out of his environment and trying to survive. There’s not even the cognizance that was barely discernible in KING KONG, that Man ripped the Gill Man from his natural home, thereby making him lash out instinctively. But there is the insipid ugly love interest (Lori Nelson, theatrically overacting with her flat face), and the bicepped aquarium jock to create a love triangle; there’s the inherent sexism, racism, teenism that goes hand-in-hand with this filmmaking era; and there’s a baby-young Clint Eastwood attempting to act in a teeny tiny comedic role as a scientist’s assistant. Slow-moving and unbearable due to emasculating the creature and removing all its danger and mystery, with an inane B-plot love farce between Agar and Nelson, it’s a, uh, fish out of water tale that drowns in the tank. Writers: Martin Berkeley, William Alland. Music: William Lava, Herman Stein. Starring: John Agar, Lori Nelson, John Bromfield, Nestor Paiva, Grandon Rhodes, Dave Willock, Clint Eastwood, Ricou Browning, Tom Hennesy.